History of computers. Where did it all start? Lets take a trip down memory lane and look at the history of computers. This page serves only as an introduction to the history of the computer. There are hundreds of pages that delve deep into this topic. It would be impractical for me to include the whole history here so I included only the parts that I thought was useful and informative. At the bottom of the page there are also links to the History of the processor and History of the internet. You will be surprised to know that the history of computers actually started thousands of years ago in China with a little device called the Abacus. Yep, that little device that people often use as a toy for their babies to keep them busy. Well, actually, people used their fingers and stones to count with before the abacus came. Imagine carrying a bunch of stones around to count with. You already had to walk long distances in those days so carrying rocks around for counting wasn't a good idea. So, in a sense you could say that the abacus was sort of the first laptop. 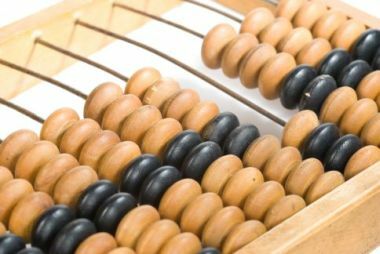 The abacus wasn't really a computer, it was more a counting device or a device to track numbers with. For instance, it was used to keep track of sheep or keep inventory information on stock or food supplies. It was also used to keep track of groups of items. This device was so popular that it quickly spread to other countries and some people still use it today. When was the first computer invented? Because of the different type of computers it is quite difficult to say exactly when the first computer was invented. The first programmable computer was actually invented between 1936 and 1937 by a German guy called Konrad Zuse. He created the first electrical binary programmable computer called the Z1. This computer and design plans were unfortunately destroyed during the second world war, but Konrad did develop later versions of the Z1 called the Z2 and Z3. 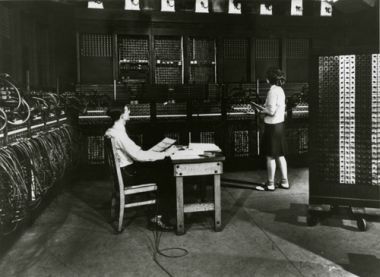 The first digital commercial computer was called the ENIAC or Electronic Numerical Integrator And Computer. See The First Computer for more information on the ENIAC and other computer firsts. ENIAC Computer Image courtesy of Computer History Museum. To be honest here, I think the whole PC or Personal Computer revolution started with Bill Gates and Steve Jobs in the early eighties and a page on the history of computers would not be complete without the mention of these two guys. Sure, there were computer firsts, but these guys made the computer easily accessible to everybody. Bill gates created Microsoft and convinced IBM or International Business Machines Corporation to sell his operating system, DOS or Disk operating System with every IBM PC sold. They sell a PC and Bill sells a license. Now that's clever. IBM thought that the real money is in hardware. Bill Gates thought it was in software. Boy, was he right. It made him one of the richest men in the world. Not bad for a guy who actually bought DOS from someone else for $50000 and licensing it to IBM. Steve Jobs, on the other hand, thought that the only way a PC should work is if you develop the software and the hardware and selling it as a complete package. Steve Jobs created a company called Apple and developed the hardware and the software. Again, a clever idea which also made him a very rich man. Another thing that made Apple computers so popular was the fact that the computers was actually nice to look at. Jobs also saw the potential of a graphical interface and created the Apple Macintosh which was the first successful commercial computer sold. Please see the links below to the history of the micro processor and internet. Find out who created the first computer and other interesting facts about the good old days. Processor History and other interesting facts about how processors came to be that forms a key part in the history of computers. The history of the internet started way back with the ARPANET or Advanced Research Projects Agency Network. At first only 2 nodes were connected but later it grew to what is now called the Internet.